Raising your vibration is a key, and important facet of ascension… And really, maintaining a high vibration is essential for staying healthy, being happy, and living vibrantly well. I’ve of course, written about raising your vibration before, and there are many tips, techniques, and practices which can help you to vibe up. The “how-to process” for raising your vibration, expanding your consciousness, and connecting with the higher realms of spirit is incredibly multi-faceted. And because we live in a vibrational universe where everything is connected… That means, everything you do, say, think, believe and even eat plays a role in your overall state of awareness, well-being and vitality. So while you’ve likely heard the saying “you are what you eat’… You also are what you think, say, believe and do. 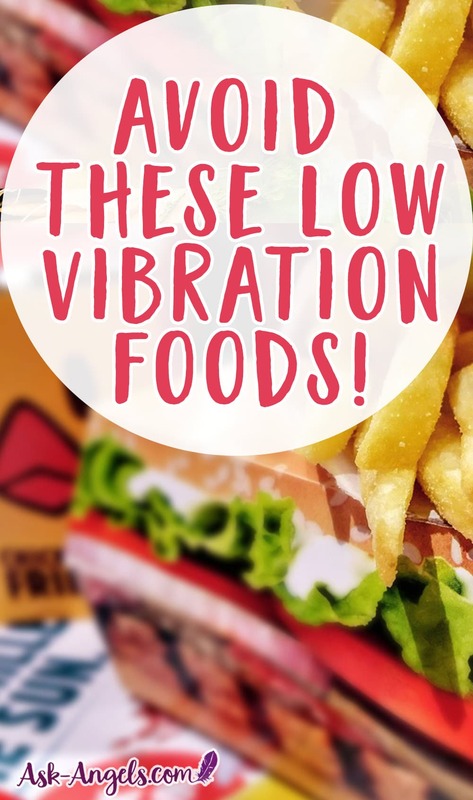 In this article I want to focus in on the diet side of the equation because what you eat and what you put in your body plays a key role in the level of vibration you are able to reach. In other words, you’re able to support yourself in raising your vibration with a high vibrational diet. And alternately, you can block your progress, cause challenges in your physical body, and create increased resistance by clouding up your mind, body and spirit with toxins and low vibrational foods. Just eating high vibrational foods is not enough! If you eat perfectly clean, and adhere to a strict raw, organic, vegan diet, but you haven’t worked to clear limiting beliefs, retrain your subconscious, or quiet the voice of negativity in your mind, or clear the lower levels of fear and doubt you’ll likely still feel blocked on your spiritual path. 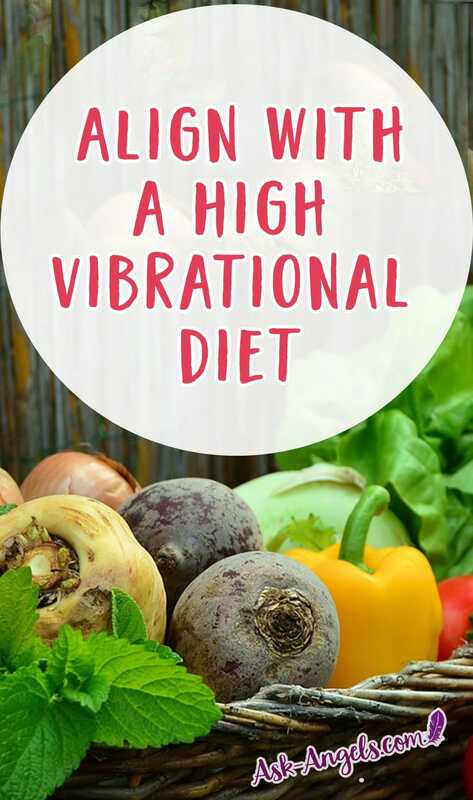 A high vibrational diet will best serve you in your life when combined with inner work, aligning with a state of love coherence, and healing on the level of body, mind, and spirit. 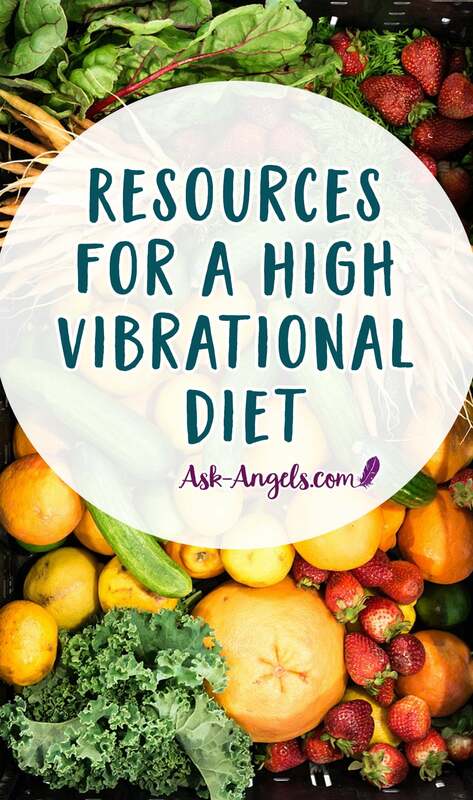 However now is a great time to make shifts in what you put into your body, and start consciously choosing more high vibration foods that nourish you and positively benefit the Earth too. For a moment, consider looking at the vibrational frequency of foods, rather than their color, texture, cost, flavor, or nutritional qualities. High vibrational foods are those that have a greater level of light than density. 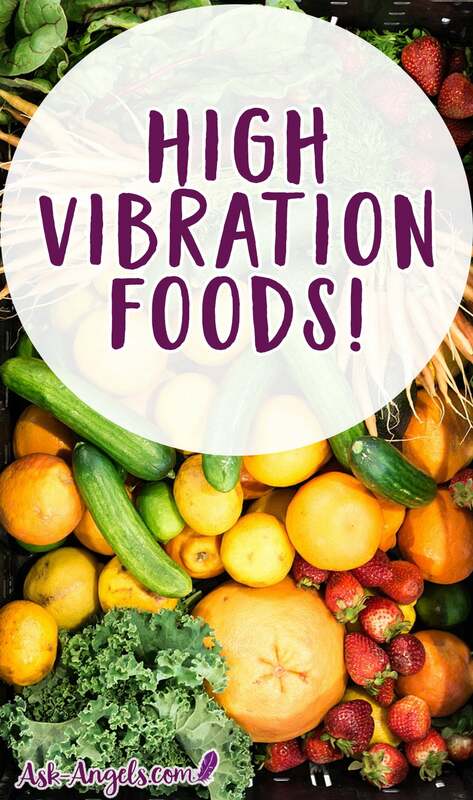 High vibration foods are those that nourish your body, assist with detoxification, increase your light quotient (the level of light you’re able to carry) and raise your vibrational frequency. The highest vibrational foods are nutrient rich, raw, living fruits and vegetables! Raw herbs like cilantro, basil, mint, tarragon, chives, dill. Sprouts! Alfalfa, mung bean, sunflower seed, brocolli sprouts, etc. Wild berries! Blueberries, strawberries, blackberries and more. I really feel one of the keys to success in transitioning to a high vibe diet is to change the way you look at food. See food as medicine, as fuel for supporting and sustaining your body and not as entertainment or a way to mood-alter. The interesting thing about this shift is when your body detoxes from toxins present in low vibe food, you actually start to crave, enjoy and desire high vibrational fruits and vegetables that really nourish support and sustain your body. When this happens, your mood is positively uplifted by foods, but in a real and sustaining and not inan instant-gratification now but pay for it later way. 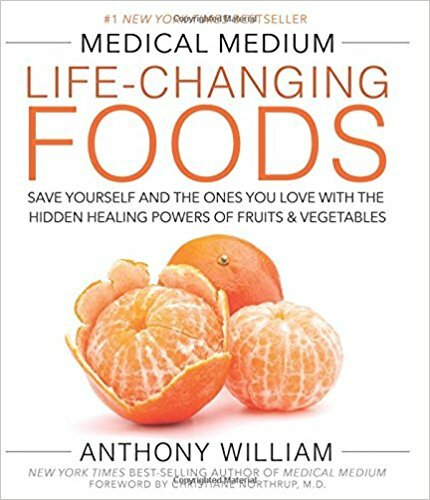 To learn more about food as medicine, and the miraculous power of food to heal… Check out Life Changing Foods, or Medical Medium. I do want to make one thing crystal clear here. This article is not meant to make you feel guilty about the way you're eating now… The key rather is to help you shift your awareness so you are making the healthiest choices to support your body, and your spiritual and ascension journey. Your thoughts are incredibly powerful… Thoughts are vibrational in nature too! The trap here would be to read this article, learn some things you’re eating are low vibrational, and then continue to eat them while judging yourself or feeling guilty. If you want to keep eating ice cream (yes sorry guys low vibrational to the core)… Do so with no guilt or judgement. Bless your ice cream, love your ice cream and eat it in a state of gratitude which will counteract though not completely balance out the low vibration. Then, consider a higher vibrational alternative like coconut milk ice cream, or make some vegan “nicecream” which can be as simple as blending up frozen bananas the next time you have that ice cream craving! Feeling guilty or judging yourself but eating it anyway only compounds the negative effects! So, love what you eat, consciously flow love into your food while preparing it, and bless your food to raise its vibration… Then, just be mindful of how you feel when you eat certain things and start taking steps to clean up your diet and transition to more veggies, whole foods, and healthy high vibe options! Learn more about Blessing Food with Light to Raise Its Vibration here! There’s really so much that goes into aligning with a healthy, high vibrational diet. Here are some more resources for you. The key here is to increase your awareness and start taking steps. On my personal journey, I grew up eating meat, cheese, sugar, and all kinds of processed foods… One step at a time I started cutting out low vibrational items and replacing them with nourishing, delicious and high vibrational foods. For me, I think it's all about taking steps, striving to eat more raw organic, and high vibe when possible, and really loving and appreciating what you do put into your body! Blessing Food with Light to Raise It's Vibration! Thank you for your compassion towards man kind. Reading this article will be the push I needed to gain control of myself. I do know that his take on this is that cultured probiotics in fermented foods don’t offer much benefit due to most all of the microorganisms die off int the stomach before reaching the small intestine … and he really focuses on produce to support gut health. As I increase my awareness in all aspects of my life I find my eating habits have changed. I am enjoying more and more greens, kale being my favorite. I cut out red meat many moons ago and although I am not vegan, I am focusing more on a plant based diet. I just came across a delectable looking green…fiddlehead ferns! Ohhh haven’t tried fiddlehead ferns… Sounds fun! Getting an abundance of plants I do believe is key. Hi Melanie, I hesitate to leave a comment, but feel a bit compelled at the same time. 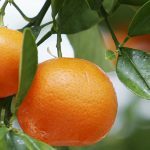 I know that it seems the most clear and obvious choice to consider all the colorful raw organic and locally grown or better, personally grown fruits, veg, herbs, etc., as high vibrational foods. I know many in the spiritual communities believe eating a more raw vegan diet will help them ascend, be more spiritual and/or increase their intuition. I have thought through this for many years. I have been vegan. I have attempted to sustain myself eating mostly raw vegan, and even as a whole foods, plant based diet. None of these worked for me as I am too sensitive to insulin. These foods simply lack many vitamins and other nutrients only available in animal foods. After over five years vegan, I changed back to eating an animal centered diet. I had written four books on how to eat a healthy whole plant foods diet prior, including my first book, Make Every Bite Count, which was a similar in theory to eating a high vibration diet. 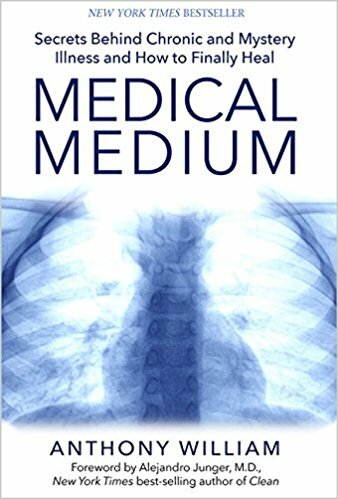 Since my own health began to decline, I went back to revisit much research that I had previously been unaware of, or through my biases, ignored. I believe we are evolutionarily best adapted to eating an animal-based diet, especially if of Northern European descent. Many indigenous populations around the world had maintained excellent physical, dental, and mental/emotional health when including animal foods. I know that many do not believe eating animals to be clean, but I would argue that it is the most natural diet. While we all want the peace, light, love, the truth is that death is part of life. I have had such an increase in vitality, psychic awareness and intuition, and divine flow since switching off the vegan diet. I know many will scorn my words, as I get attacked by vegans online all the time. I have found research indicating that vegans have higher rates of depression and mental problems. I think it is not an ideal diet for long term, but that is my opinion. I enjoy your videos, and I too studied channeling w/ Betsy many years back. But for me, the fruits and vegetable approach sounded right and good, but the consequences were not as expected. My vision, teeth, hair, skin, digestion, and blood sugar balance, memory retention, and more all were declining on a whole foods, healthy, ‘clean’ diet. That being said … If you are going to eat meat and feel it is required for you, balancing it with an abundance of high vibe fruits and veggies is key. Unless you are farming the dairy yourself, the animals are being hurt for its creation, as dairy cows are treated very inhumanely and caused a great deal of pain and suffering in their lives. Also, the guidance I have received is that all humans are lactose intolerant to some level (even if they do not realize it) … Cows milk is challenging for our body to digest and can cause our mental/ intuitive capacities to become clogged in a way. If your concern is the happiness of the cows though, I would do some research as to whether cows really are treated humanely… and discover for yourself. Many blessings to you and I do thank you for your comment! ✨💖😇 Love and blessings back your way! Thanks for commenting. Thank you so much Melanie! The non judgement part is so huge for me, as I am currently in the transition of going from veggie to vegan and sometimes I do slip up. Its definitely a journey in patience and trust and reading about the fact that even if i do decide to eat cheese one day, I am not being a hypocrite by still wanting to bless my food, having gratitude for it, and simply letting myself enjoy! Wow! Brillant and very much appreciated. Love and light to you! This is one of the best article which could transform each one of our lives if followed rigorously with perseverance. Personally, I found out a secret which may be right or wrong but the food actually chooses us and then we prefer according to our intuitions. There is definitely between mind, body and food. It somehow enhances our connection with our beautiful Nature and the way we love Nature, she provides us accordingly. After sometime our rationality activates and we diffrentiatw between right/wrong food for our body. Thank you for your articles and videos! Hi Melanie. I’ve been following you for a while and love your meditations. I recently wrote a blog post entitled “ the ascension diet”. I hope you will check it out. I shared this on Facebook as I am completely on the same page with you.